To get started with this Byte, create a New Project and a New Scene, or perhaps just a new scene if you want to incorporate this into your existing game. Create a New Folder under the Assets folder and name it as Skins. Within this folder create a new Skin by right clicking on Skins->Create->GUI Skin and name it as whatever you like. I am naming mine as Skin. Create a New Folder for our scripts as well and name it Scripts. 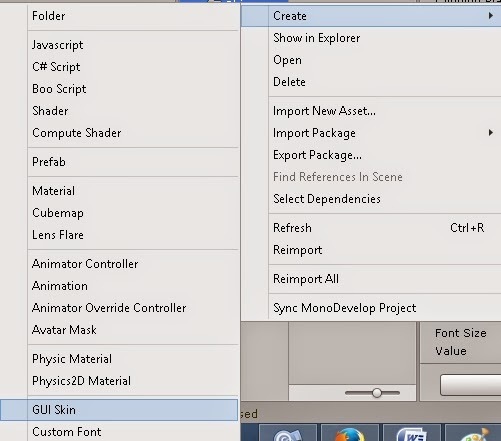 Within this folder add a C# script by right clicking on Scripts->Create->C# Script and name it as MainMenuScript. Attach this script to the Main Camera. Next we will add some code to this script. Double click on the script to open it. In the Start function we will check if the screen size on which the game is being played is different from the one which it was designed for. If so, we will calculate the new font size for that particular screen size. 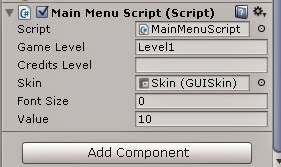 In the OnGUI function, we will set the GUI skin to the new skin i.e., custom skin, which was created earlier. Further, we will set the font size of the Button and Box to the newly calculated value, if the screen size is different or the desired font size, if not. Of course we will create the GUI box, buttons which the menu will be comprised of. After we have assigned the new font size, we have written some code which creates a GUI Box which is basically what it means, a box which contains some GUI elements inside it. In our case, Buttons. we have created a new Rect object with starting point as Screen.width/8 and 10 units from the top left. Screen.width/8 is the horizontal distance from the left of the screen and 10 is the vertical distance from the top. The next two parameters, 3*Screen.width/4 and 3*Screen.height/4, are the width and height of the box respectively. By using the Screen.width and Screen.height, instead of numbers, we are making the size and positions dependent on the Screen size, so as to make it dynamic or Screen Size dependent. The last parameter, "MAIN MENU", is the heading of this box. The parameters of the GUI Buttons are made screen size dependent by following the same procedure mentioned above. It's time to test our dynamic Main Menu then, click on the Play button or press ctrl+P on windows or cmd+P on the mac to test this beast. Try changing the Game aspect from Free Aspect to to other values and see the dynamic Main Menu in action.